Inflation Finally Emerging? Probably Not. Yesterday we got the latest numbers (February) for Personal Consumption Expenditure (PCE), the Fed’s favourite price inflation measure. It’s their favourite because it does the best job of suppressing the real rate of inflation. For the first time since 2012, the headline number actually surpassed the Fed’s target of 2.0%, hitting 2.1% year-over year. The core number (removing energy and food) was 1.8%. If these numbers look anything like the inflation you are experiencing, you must be living in a rabbit hole. But that’s not the point. The point is that the market is expecting—and wants—higher inflation as part of the Trump Reflation Trade, otherwise known as the Trump Economic Miracle. Are we actually beginning to see an increase in inflation in the official numbers? No. As always, you need to be careful with numbers from your friendly government department. The economy is still experiencing the pass-through of last year’s oil price increases but the oil price itself is no longer rising. The higher PCE year-over-year is likely ‘transitory’ as the Fed likes to say. Here’s the proof. In the same report that gives us a 2.1% headline increase in the PCE YEAR-OVER-YEAR we find that the PCE only rose 0.1 percent in February from the month before and January’s increase was also below expectations. The official inflation rate is actually falling. The expected Trump Economic Miracle has four main components: Faster growth, higher inflation, more interest rate hikes and a stronger dollar. So, how are we doing? Not good at all. 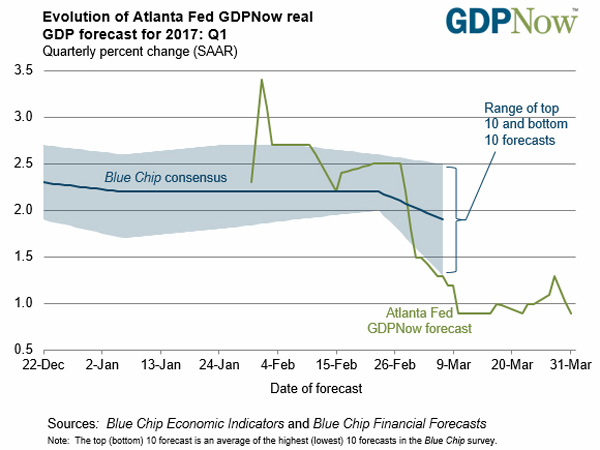 The Atlanta Fed’s projection for real first quarter GDP growth fell again last week to just 0.8%. Inflation is trending down month-to-moth as the latest PCE numbers indicate. The dollar is also falling. It’s down since the start of the year (see below). The fourth pillar is a rapid-fire series of fed rate hikes due to expected strength in the economy and rising inflation. I don’t think so. That suggests to me that all the pieces are falling in place for gold to do much better. All that’s needed is for the markets to see what is actually happening. There is no hard evidence of a Trump Economic Miracle.